As you can probably guess the “twist” here is the substitution of an ale yeast for a lager yeast. In this case I used some Saflager W-34/70 I had harvested from my previous Vienna Lager brew. Another twist, because I guess that’s what I’m calling any change at this point, is in my water chemistry. 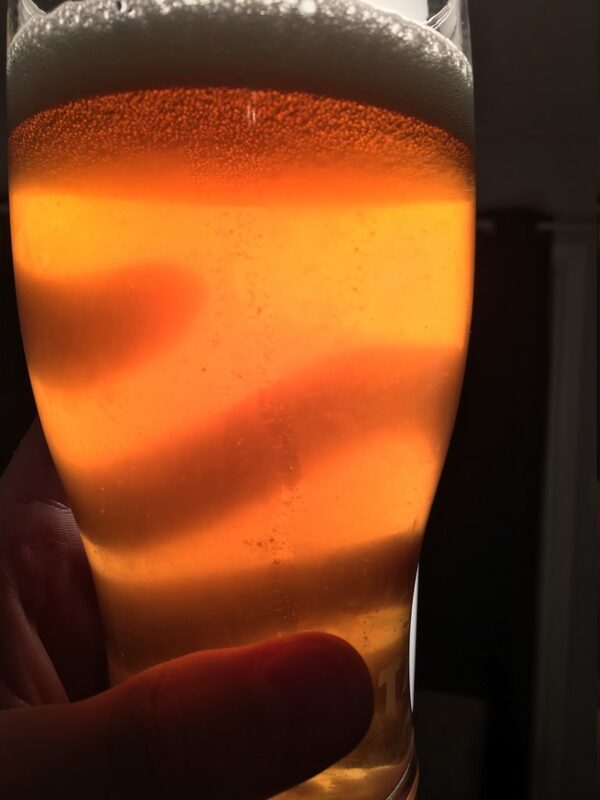 The first time I brewed the Centennial Blonde Ale I just used my local city tap water. This time however I started with reverse osmosis (RO) water and added 2 tsp of calcium chloride and 1 tsp of gypsum. I also threw in 2% acidulated malt to the grist as well. First I didn’t add any salts to the mash, those got added into the wort while it was coming up to a boil. Secondly while the mash was going I would stir it every 20 minutes or so. The final change was being intentional in allowing the strike water to sit undisturbed for around 10 minutes after adding it to my mash tun. Only once the time was up would I then stir and start Vorlaufing as normal. By making these three changes I was able to get a starting gravity (SG) reading of 1.041 which I’ve calculated to be about 83.6% efficiency, much higher than the ~70% I was getting previously. The brew day was otherwise normal and I ended up getting an original gravity (OG) reading of 1.048 which was higher than the recipe target, likely thanks to my increased efficiency. I suppose I could have boiled for less but I’m OK with it. The beer fermented out and I bottled it three weeks later. The final gravity (FG) reading was 1.011 which gave me an estimated ABV of 4.86%. Smell Slightly sweet smell that I’m pretty sure exactly matches the ale version if not for the lager aromas added by the yeast. Appearance Light and so clear that the colour becomes noticeably darker or lighter depending on what’s behind the glass. Carbonation seems about right and a nice head forms when poured but dissipates relatively quickly afterwards. Taste As expected the only real difference in taste that I noticed between this and the original recipe is around the yeast profile. I recall the ale version tasting a bit more full and almost heavy in comparison whereas the lager version tastes lighter but also has more of a yeast flavour. Sometimes that detracts from the beer but in this case I think it actually works out well. So what’s the conclusion? Is the lager version better than the ale version? I don’t think it’s that simple. They are so close in taste that I honestly think it likely comes down to personal preference. To me both versions are nice easy drinking beers but if I absolutely had to reach for some form of conclusion I would say that given the slight flavour differences I could see a case being made for when you might want to drink one over the other. For instance, the lager version could be nicer in the hot spring/summer while the ale version might be nicer in the fall/winter. But really both would be good to drink any time of the year. Has anyone else ever taken one of their favourite recipes and swapped out the yeast like this to see what the results would be? I’d love to heard about it in the comments if you have! P.S. – continuing the lazy streak we just called this brew “Centennial Blonde Lager”. Great article, thanks for sharing. What temperature did you ferment at for the 21 days? Just primary vessel the entire time? Only ever in primary but I did let it initially ferment in my basement – it’s winter here so that was probably around 15C-ish – and then I did a 24 hour diacetyl rest upstairs where it was about 20C and finally I lagered for a few days in my garage where it was around 2-5C.